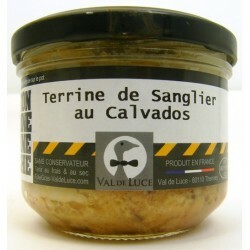 Delicious wild boar pâté, flavoured with calvados, made in France. Bliss on toast! Ingredients: Wild boar, pork, eggs, onions, calvados, salt, modified starch, garlic, pepper and nutmeg. Well flavoured, savoury pâté. Serve chilled on crusty bread or thin toast.